I waited patiently in front of the Royal Exchange, in three layers of make up. My dear friend / film producer / cameraman walked enthusiastically over with a bulging pocket. And the full dread of being filmed, at lunchtime, in London’s financial district, suddenly filled me. Steely eyes stared back. I got his drift. Normally, I am a shameless self publicist. But merrily shopping with a big smile while the credit crunch wipes if off everyone else’s was a tad shameless too far. Even the cab driver sighed “cutbacks” when I asked him to drop me some two minutes down the road. And then there were the do-I-recognise-this-Z-list-celebrity stares. I half contemplated hand writing a placard saying “No. You do not know who I am“. I quickly checked out the gorgeous silver jewellery at Tateossian, then bought a stash of chocolates at Paul A Young and fled the area. It was just as well that this video‘s theme was Comfort Eating. 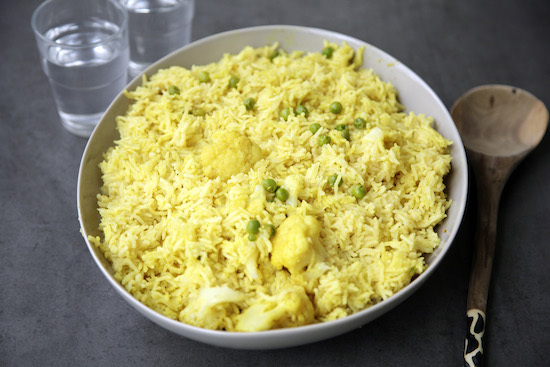 I cooked Taheri, a moreish vegetable pulao with cauliflower, peas and potatoes from North India, with my friend Boobie’s Anda or egg Raita. The Egg Raita might take some getting used to. But, like my cookery video jaunts, once you try it there really is no going back. Bring the oil to heat over a high flame in a large pot. When it’s hot, stir in the ginger and as it starts going golden mix in the cauilflower and potatoes. Stir for a minute until the vegetables are sealed all over and add the spice powders. Mix viciously for another minute to coat all the vegetables with the masalas. If the masalas stick to the bottom of the pot, add a bit of hot water and scrape it off. Then rinse it rice thoroughly in a sieve under a tap and pour it into the masalas. Stir it well mixing into the spices for about a minutes, then mix through 3.5 cups of hot water and the salt and bring to the boil. When it starts bubbling, lower the heat and simmer covered for 10 minutes until the rice absorbs all the water and is cooked through. Keep the lid on for the rice for at least another ten minutes before you serve. This will keep the steam in and make sure the rice absorbs all the moisture and flavour. Also, best not to handle very hot rice as it just falls apart. This is my sixth time to your page, I love it every time!